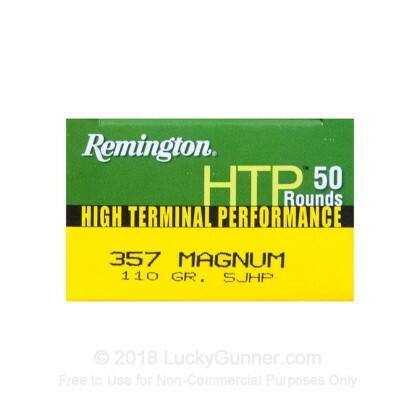 Remington 357 Mag HTP gives you the confidence and instant-stopping power you need for when it matters most! 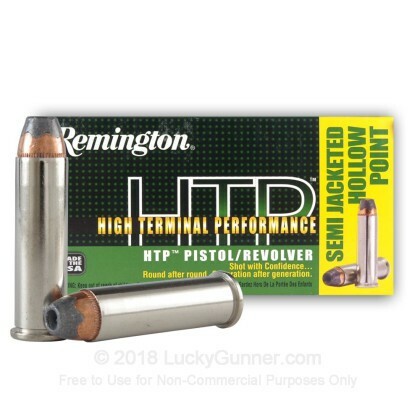 This Remington High Terminal Performance (HTP) ammo is crafted of premium primers, brass cases, and lethal hollow point projectiles. The HTP bullets are designed to deliver excellent controlled expansion and maximum weight retention making them the ideal self defense cartridge. This product is brand new, brass, boxer-primed, non-corrosive and reloadable. Great product. I just ran 200 rounds through my new S&W Performance Center Model 327 TRR8 and it was tremendous fun. No FTF at all and the ammo burned very clean. Will buy more! Great price and fires nicely. Fired 200 of these rounds at the range today and they did nicely. Good clean burn, solid but nice kick and came out upon ejection nicely along with going in smoothly as well. No FTF so far either from the 200 I fired. For this great price these are a very nice little range round or anything else you have in mind, they do nicely at least out of a Ruger GP100 357 mag revolver. Looks good with a great price. My order was shipped on 1/2/17 and arrived 1/5/17, good timing I'd say considering I'd place the order literally before news years. Everything was nicely packaged in a plain box I requested it to be put in, rather not have any clear signs being easily seen showing others what is in the box, just to be safe. Ammo boxes and ammo so far look fine with no damage of any apparent short after opening two (small number out of 100 I know), will hopefully be able to hit the range this weekend and see how they do out of my gp100 357 mag revolver. Will update the ratings once I've 'actually' fired some of them so anyone interested will know how they do. One reason I enjoy shopping here (first order from LG) is the reviews letting others know how they were along with info about the items in question. Ordered these 2 weeks ago and received them in 3 days, as usual! This was a great value for a well performing and fairly clean firing ammo. I would recommend this brand, especially for your wheel gun. 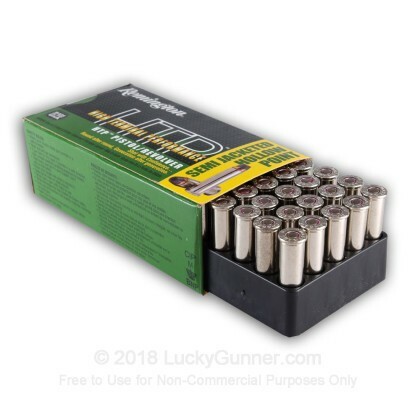 Lucky Gunner is my only "go to" for ammo purchases, as their ordering system is simple and easy, shipping is timely and their product quality and reviews are always right on. 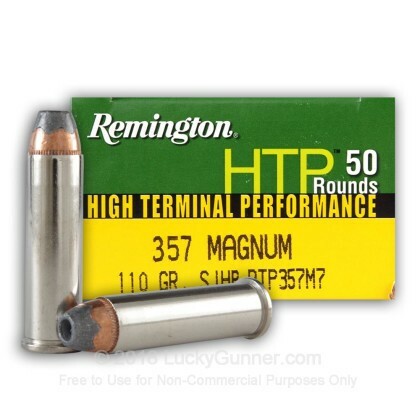 We also have this 357 Mag - 110 Grain SJHP - Remington HTP - 50 Rounds ammo in stock in a smaller quantity.